As a creative entrepreneur you might find yourself constantly under pressure to finish a job for your clients on time. Of course there is plenty of websites where you can buy ready-to-use graphics but why spending money on something you can have for free? If you are looking for some free graphic assets, templates, images or anything else for your graphic design needs, look no further. This is the collection of the best high quality freebies websites that will save you hours of your precious time and you can start concentrating on new clients or something else. 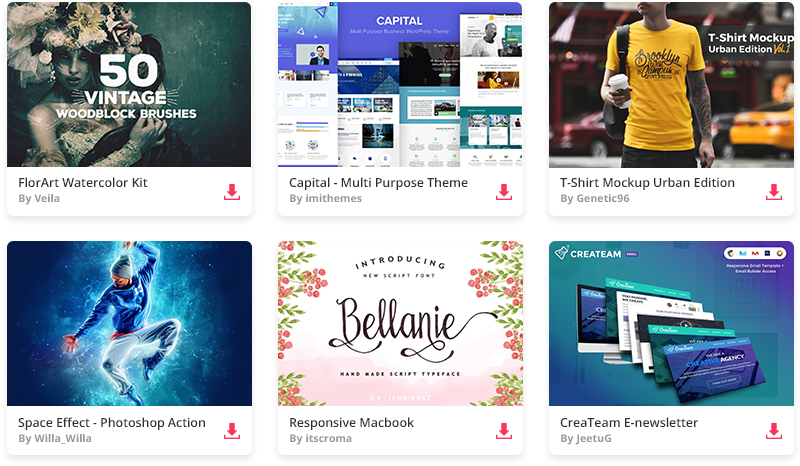 Envato Elements is another branch of Envato Market and it offers a subscription service for design assets for creative professionals at larger businesses and design agencies. They also offer some high quality freebies. Click here to download them. This website offers free PSD files and other free design resources from the biggest online design community called Dribbble. You can find here lots of free fonts, mock-ups, UI kits, icons, website templates, patterns and textures. Expand your possibilities with this great collection of free t-shirt designs. They are all vector images so you can scale them without losing any quality. Creative Market is one of the best websites for handcrafted, mousemade design content like vector patterns, icons, photoshop brushes, fonts and more more graphic assets. You can download 6 free goods from their website every week. Another great website / search engine that offers free high quality stock photos to help you easily create beautiful products and designs. They offer over 40,000 photos at the moment. All the photos are licenced under the Creative Commons Zero (CC0) licence. You do not need to register to download anything. Search through over 1.3 million images, illustrations, vector graphics, videos and more on Pixabay, all free for commercial use. There’s no need to sign up, you can start dowloading straight away. As its name says this website concentrates mostly on free Photoshop Brushes, but you can find lots of patterns, textures and Photoshop PSD files here as well. Envato Market offers everything you need for your next creative project. You can find here over 9 million digital products created by a global community of designers, developers, photographers, illustrators & producers. Envato Market is divided into 7 main categories: Web Themes & Templates, Code, Video, Audio, Graphics, Photos and 3D files. Six of these websites offer 1 new freebie every month. Just click the link below, press CTRL + F in your browser and search words “free items”. VideoHive – Produce slick videos and motion graphics with a huge range of stock footage, After Effects logos and intros, Apple Motion templates and more. AudioJungle – Add emotion, energy and impact to your projects with music and sound effects for film, games, trailers, promos, podcasts, backgrounds and more. GraphicRiver – Design slick flyers, resumes, logos and banners faster with a huge library of illustrations, icons, web elements, templates and more. PhotoDune – Find the perfect royalty free image, from weddings to fashion, business, food, family, fitness, people, tech, travel and more. 3DOcean – Enhance your games, animations and 3D projects with models, textures, materials, base meshes, plugins and more. If you are looking for some icons, this website is the largest search engine of free icons available in PNG, SVG, EPS, PSD and BASE 64 formats. They offer high quality and totally editable vectors. This website has been founded by the same people as Freepik. Another website with more than 105 thousand free icons for creative professionals. Here you can find high quality freebies for your next projects. Vecteezy makes it easy to explore thousands of graphics created by vector artists from all over the globe.